This is the story of a baby elephant and a cow who are the best of friends. One day they are walking in the forest when they come upon a banana tree laden with ripe fruit. 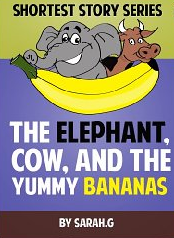 Cow asks elephant to reach the banana by using its trunk. Elephant obliges him, but suddenly elephant remarks, “I am hungry and I will have it.” Cow is upset and reminds his friend that he saw the tree first and should have its fruit. The two friends argued for a long time. After a while, a monkey sauntered by. The two friends asked him to be a mediator dividing the bananas equally and offering him a share. Monkey thought for a time before jumping up into the tree grabbing a banana and then peeling it. He did not divide the banana, but peeled it giving cow and monkey equal pieces of peel. Then he began to eat all of the banana himself! The elephant asked him, “Why are you justified in eating the banana and giving us only the peel?” Then the monkey pointed out that they are two friends who are on opposite sides arguing, but that he is in the middle. Isn’t it logical that he should eat the middle part, while the two parties arguing eat the parts that are on the two sides? While the two friends pondered about this, the monkey ate all the rest of the bananas and left cow and elephant with only the peels. Finally, the two friends realized their mistake. Elephant was the first to yield. They admit to each other that they were wasting time arguing, and that friends need to share with each other. By being greedy, each of them was exploited by the monkey. From that day on, cow and elephant resolve to play and help each other sharing without hesitation. Yes, such a quick read that hits so many important points!